"Do not be proud of your knowledge and do not trust that you are a scholar. Get advice from the ignorant as well as from the knowing, because there is no limit to the art, and no artist has his excellence entirely! " The teachings of Vizier Ptahhotep from 4 400 years ago. for its artists. Egypt - together with its original art has become an infinite inspiration for me. Berlin “face to face” and at the moment, I am working on creation of it. When expressing the egyptian mythology, I am using techniques like acryl, oil, watercolor, drawing, linocut, collage and other. The old Egyptians used glass in their daily life and also for artistic purposes (for example externalization of eyes in plastics). 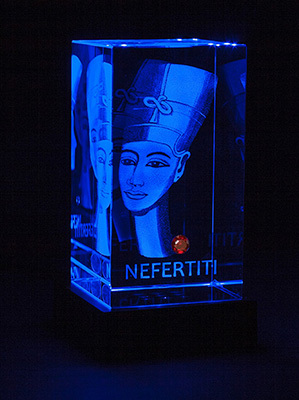 I also create the egyptian motives from the Czech crystal or with the 3D laser. I have also created a seven-part cycle of a coloring book for children that brings the children closer to this important part of history. My passion for drawing started at the age of 7 with winning an art competition organized by Czech Radio, where the prize was a doll of one of a kid’s cartoon characters. When I was 14 I began to do oil painting. I graduated at the Academy of Arts, Architecture and Design in Prague – scenography field. After the university I moved to Slovakia, where I worked in Osveta publishing for a couple of years and was designing scenes for various cultural and musical events, illustrations, banners and posters etc. When I returned to Prague in 1976 I started working in advertising, promotion and marketing. I’ve been presenting my pictures and drawings since 1986. I also worked as a guarantor for exhibitions and shows in both the Czech Republic and abroad, and for promoting medical equipment (I designed a glass heart – it was made in Novy Bor glass factory – as a presentation of a Cardiag – a new product for a heart examination). I interpreted my interest in Egyptian mythology in my paintings, drawings, linocuts, and since 2016, also in glass. I’ve visited several Egyptian historical sites many times since 1999, which taught me a great patience. I am interested in Egyptian culture from its mythological and artistic points and its legacy is a massive inspiration for me. I now study and draw a bust of the queen Nefertiti, which I’ve seen in a Berlin museum. I consider my artistic expression unique and personal, I am inspired by the huge energy that I feel from Egyptian art, its colors, its forms and its details. It pleases me to look for new themes, and to connect to them and express them at least by a fraction. I believe and hope that you will appreciate my work.